Not to be confused with Pecten (biology), Pecten oculi, or Pecten (bivalve). Pectin (from Ancient Greek: πηκτικός pēktikós, "congealed, curdled") is a structural heteropolysaccharide contained in the primary cell walls of terrestrial plants. It was first isolated and described in 1825 by Henri Braconnot. It is produced commercially as a white to light brown powder, mainly extracted from citrus fruits, and is used in food as a gelling agent, particularly in jams and jellies. It is also used in dessert fillings, medicines, sweets, as a stabilizer in fruit juices and milk drinks, and as a source of dietary fiber. In plant biology, pectin consists of a complex set of polysaccharides (see below) that are present in most primary cell walls and are particularly abundant in the non-woody parts of terrestrial plants. Pectin is a major component of the middle lamella, where it helps to bind cells together, but is also found in primary cell walls. Pectin is deposited by exocytosis into the cell wall via vesicles produced in the golgi. The amount, structure and chemical composition of pectin differs among plants, within a plant over time, and in various parts of a plant. Pectin is an important cell wall polysaccharide that allows primary cell wall extension and plant growth. During fruit ripening, pectin is broken down by the enzymes pectinase and pectinesterase, in which process the fruit becomes softer as the middle lamellae break down and cells become separated from each other. A similar process of cell separation caused by the breakdown of pectin occurs in the abscission zone of the petioles of deciduous plants at leaf fall. Pectin is a natural part of the human diet, but does not contribute significantly to nutrition. The daily intake of pectin from fruits and vegetables can be estimated to be around 5 g if approximately 500 g of fruits and vegetables are consumed per day. In human digestion, pectin binds to cholesterol in the gastrointestinal tract and slows glucose absorption by trapping carbohydrates. Pectin is thus a soluble dietary fiber. In non-obese diabetic (NOD) mice pectin has been shown to increase the incidence of diabetes. A study found that after consumption of fruit the concentration of methanol in the human body increased by as much as an order of magnitude due to the degradation of natural pectin (which is esterified with methyl alcohol) in the colon). Pectin has been observed to have some function in repair the DNA of some types of plant seeds, usually desert plants. Pectinaceous surface pellicles, which are rich in pectin, create a mucilage layer that holds in dew that helps the cell repair its DNA. Consumption of pectin has been shown to slightly (3-7%) reduce blood LDL cholesterol levels. The effect depends upon the source of pectin; apple and citrus pectins were more effective than orange pulp fiber pectin. The mechanism appears to be an increase of viscosity in the intestinal tract, leading to a reduced absorption of cholesterol from bile or food. In the large intestine and colon, microorganisms degrade pectin and liberate short-chain fatty acids that have positive influence on health (prebiotic effect). Pectins, also known as pectic polysaccharides, are rich in galacturonic acid. Several distinct polysaccharides have been identified and characterised within the pectic group. Homogalacturonans are linear chains of α-(1–4)-linked D-galacturonic acid. Substituted galacturonans are characterized by the presence of saccharide appendant residues (such as D-xylose or D-apiose in the respective cases of xylogalacturonan and apiogalacturonan) branching from a backbone of D-galacturonic acid residues. Rhamnogalacturonan I pectins (RG-I) contain a backbone of the repeating disaccharide: 4)-α-D-galacturonic acid-(1,2)-α-L-rhamnose-(1. From many of the rhamnose residues, sidechains of various neutral sugars branch off. The neutral sugars are mainly D-galactose, L-arabinose and D-xylose, with the types and proportions of neutral sugars varying with the origin of pectin. Another structural type of pectin is rhamnogalacturonan II (RG-II), which is a less frequent, complex, highly branched polysaccharide. Rhamnogalacturonan II is classified by some authors within the group of substituted galacturonans since the rhamnogalacturonan II backbone is made exclusively of D-galacturonic acid units. Isolated pectin has a molecular weight of typically 60,000–130,000 g/mol, varying with origin and extraction conditions. The non-esterified galacturonic acid units can be either free acids (carboxyl groups) or salts with sodium, potassium, or calcium. The salts of partially esterified pectins are called pectinates, if the degree of esterification is below 5 percent the salts are called pectates, the insoluble acid form, pectic acid. Some plants, such as sugar beet, potatoes and pears, contain pectins with acetylated galacturonic acid in addition to methyl esters. Acetylation prevents gel-formation but increases the stabilising and emulsifying effects of pectin. Amidated pectin is a modified form of pectin. Here, some of the galacturonic acid is converted with ammonia to carboxylic acid amide. These pectins are more tolerant of varying calcium concentrations that occur in use. To prepare a pectin-gel, the ingredients are heated, dissolving the pectin. Upon cooling below gelling temperature, a gel starts to form. If gel formation is too strong, syneresis or a granular texture are the result, while weak gelling leads to excessively soft gels. Pectins gel according to specific parameters, such as sugar, pH and bivalent salts (especially Ca2+). In high-ester pectins at soluble solids content above 60% and a pH-value between 2.8 and 3.6, hydrogen bonds and hydrophobic interactions bind the individual pectin chains together. These bonds form as water is bound by sugar and forces pectin strands to stick together. These form a 3-dimensional molecular net that creates the macromolecular gel. The gelling-mechanism is called a low-water-activity gel or sugar-acid-pectin gel. In low-ester pectins, ionic bridges are formed between calcium ions and the ionised carboxyl groups of the galacturonic acid. This is idealised in the "egg box-model". Low-ester pectins need calcium to form a gel, and can do so at lower soluble solids and higher pH-values than high-ester pectins. Normally low-ester pectins form gels with a range of pH from 2.6 to 7.0 and with a soluble solids content between 10 and 70%. High-ester pectins set at higher temperatures than low-ester pectins. However, gelling reactions with calcium increase as the degree of esterification falls. Similarly, lower pH-values or higher soluble solids (normally sugars) increase gelling speeds. Suitable pectins can therefore be selected for jams and jellies, or for higher-sugar confectionery jellies. Pears, apples, guavas, quince, plums, gooseberries, and oranges and other citrus fruits contain large amounts of pectin, while soft fruits, like cherries, grapes, and strawberries, contain small amounts of pectin. The main raw materials for pectin production are dried citrus peels or apple pomace, both by-products of juice production. Pomace from sugar beets is also used to a small extent. From these materials, pectin is extracted by adding hot dilute acid at pH-values from 1.5 – 3.5. During several hours of extraction, the protopectin loses some of its branching and chain length and goes into solution. After filtering, the extract is concentrated in a vacuum and the pectin is then precipitated by adding ethanol or isopropanol. An old technique of precipitating pectin with aluminium salts is no longer used (apart from alcohols and polyvalent cations, pectin also precipitates with proteins and detergents). Alcohol-precipitated pectin is then separated, washed and dried. Treating the initial pectin with dilute acid leads to low-esterified pectins. When this process includes ammonium hydroxide (NH3(aq)), amidated pectins are obtained. After drying and milling, pectin is usually standardised[clarification needed] with sugar and sometimes calcium salts or organic acids to have optimum performance in a particular application. The main use for pectin is as a gelling agent, thickening agent and stabilizer in food. The classical application is giving the jelly-like consistency to jams or marmalades, which would otherwise be sweet juices. Pectin also reduces syneresis in jams and marmalades and increases the gel strength of low-calorie jams. For household use, pectin is an ingredient in gelling sugar (also known as "jam sugar") where it is diluted to the right concentration with sugar and some citric acid to adjust pH. 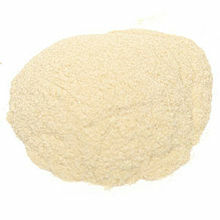 In some countries, pectin is also available as a solution or an extract, or as a blended powder, for home jam making. For conventional jams and marmalades that contain above 60% sugar and soluble fruit solids, high-ester pectins are used. With low-ester pectins and amidated pectins, less sugar is needed, so that diet products can be made. Pectin is used in confectionery jellies to give a good gel structure, a clean bite and to confer a good flavour release. Pectin can also be used to stabilize acidic protein drinks, such as drinking yogurt, to improve the mouth-feel and the pulp stability in juice based drinks and as a fat substitute in baked goods. Typical levels of pectin used as a food additive are between 0.5 and 1.0% – this is about the same amount of pectin as in fresh fruit. In medicine, pectin increases viscosity and volume of stool so that it is used against constipation and diarrhea. Until 2002, it was one of the main ingredients used in Kaopectate a medication to combat diarrhea, along with kaolinite. It has been used in gentle heavy metal removal from biological systems. Pectin is also used in throat lozenges as a demulcent. In cosmetic products, pectin acts as a stabilizer. Pectin is also used in wound healing preparations and specialty medical adhesives, such as colostomy devices. Sriamornsak revealed that pectin could be used in various oral drug delivery platforms, e.g., controlled release systems, gastro-retentive systems, colon-specific delivery systems and mucoadhesive delivery systems, according to its intoxicity and low cost. It was found that pectin from different sources provides different gelling abilities, due to variations in molecular size and chemical composition. Like other natural polymers, a major problem with pectin is inconsistency in reproducibility between samples, which may result in poor reproducibility in drug delivery characteristics. In ruminant nutrition, depending on the extent of lignification of the cell wall, pectin is up to 90% digestible by bacterial enzymes. Ruminant nutritionists recommend that the digestibility and energy concentration in forages be improved by increasing pectin concentration in the forage. In cigars, pectin is considered an excellent substitute for vegetable glue and many cigar smokers and collectors use pectin for repairing damaged tobacco leaves on their cigars. Yablokov et al., writing in Chernobyl: Consequences of the Catastrophe for People and the Environment, quote research conducted by the Ukrainian Center of Radiation Medicine and the Belarusian Institute of Radiation Medicine and Endocrinology, concluded, regarding pectin's radioprotective effects, that "adding pectin preparations to the food of inhabitants of the Chernobyl-contaminated regions promotes an effective excretion of incorporated radionuclides" such as cesium-137. The authors reported on the positive results of using pectin food additive preparations in a number of clinical studies conducted on children in severely polluted areas, with up to 50% improvement over control groups. During the Second World War, Allied pilots were provided with maps printed on silk, for navigation in escape and evasion efforts. The printing process at first proved nearly impossible because the several layers of ink immediately ran, blurring outlines and rendering place names illegible until the inventor of the maps, Clayton Hutton, mixed a little pectin with the ink and at once the pectin coagulated the ink and prevented it from running, allowing small topographic features to be clearly visible. At the Joint FAO/WHO Expert Committee Report on Food Additives and in the European Union, no numerical acceptable daily intake (ADI) has been set, as pectin is considered safe. In the United States, pectin is generally recognized as safe for human consumption. In the International Numbering System (INS), pectin has the number 440. In Europe, pectins are differentiated into the E numbers E440(i) for non-amidated pectins and E440(ii) for amidated pectins. There are specifications in all national and international legislation defining its quality and regulating its use. Pectin was first isolated and described in 1825 by Henri Braconnot, though the action of pectin to make jams and marmalades was known long before. To obtain well-set jams from fruits that had little or only poor quality pectin, pectin-rich fruits or their extracts were mixed into the recipe. During the Industrial Revolution, the makers of fruit preserves turned to producers of apple juice to obtain dried apple pomace that was cooked to extract pectin. Later, in the 1920s and 1930s, factories were built that commercially extracted pectin from dried apple pomace and later citrus peel in regions that produced apple juice in both the US and Europe. ^ Braconnot, Henri (1825) "Recherches sur un nouvel acide universellement répandu dans tous les vegetaux" (Investigations into a new acid spread throughout all plants), Annales de chimie et de physique, series 2, 28 : 173-178. From page 178: … je propose le nom pectique, de πηχτες, coagulum, … ( … I propose the name pectique, from πηχτες [pectes], coagulum [coagulated material, clot, or curd], … ). ^ Braidwood, Luke; Breuer, Christian; Sugimoto, Keiko (1 August 2013). "My body is a cage: mechanisms and modulation of plant cell growth". New Phytologist. 201 (2): 388–402. doi:10.1111/nph.12473. PMID 24033322. ^ Grierson, D; Maunders, MJ; Slater, A; Ray, J; Bird, CR; Schuch, W; Holdsworth, MJ; Tucker, GA; Knapp, JE (1986). "Gene expression during tomato ripening". Philosophical Transactions of the Royal Society of London B. 314 (1166): 399–410. doi:10.1098/rstb.1986.0061. ^ Toivonen, R. K.; Emani, R.; Munukka, E.; Rintala, A.; Laiho, A.; Pietilä, S.; Pursiheimo, J. P.; Soidinsalo, P.; Linhala, M.; Eerola, E.; Huovinen, P.; Hänninen, A. (Oct 2014). "Fermentable fibres condition colon microbiota and promote diabetogenesis in NOD mice". Diabetologia. 57 (10): 2183–92. doi:10.1007/s00125-014-3325-6. PMID 25031069. ^ Lindinger, W.; Taucher, J.; Jordan, A.; Hansel, A.; Vogel, W. (Aug 1997). "Endogenous production of methanol after the consumption of fruit". Alcohol Clin Exp Res. 21 (5): 939–43. doi:10.1111/j.1530-0277.1997.tb03862.x. PMID 9267548. ^ Huang, Zhenying; Gutterman, Yitzchak; Osborne, Daphne J. (30 July 2004). "Value of the mucilaginous pellicle to seeds of the sand-stabilizing desert woody shrub Artemisia sphaerocephala (Asteraceae)". Trees. 18 (6): 669–676. doi:10.1007/s00468-004-0349-4. Retrieved 26 February 2019. ^ Huang, Z.; Boubriak, I.; Osborne, D. J.; Dong, M.; Gutterman, Y. (2008-01-01). "Possible Role of Pectin-containing Mucilage and Dew in Repairing Embryo DNA of Seeds Adapted to Desert Conditions". Annals of Botany. 101 (2): 277–283. doi:10.1093/aob/mcm089. ISSN 0305-7364. PMC 2711012. PMID 17495979. ^ Brouns, F; Theuwissen, E; Adam, A; Bell, M; Berger, A; Mensink, R P (2011). "Cholesterol-lowering properties of different pectin types in mildly hyper-cholesterolemic men and women". European Journal of Clinical Nutrition. 66 (5): 591–599. doi:10.1038/ejcn.2011.208. ISSN 0954-3007. PMID 22190137. ^ Sriamornsak, Pornsak (2003). "Chemistry of Pectin and its Pharmaceutical Uses: A Review". Silpakorn University International Journal. 3 (1–2): 206. ^ Gómez, Belén; Gullón, Beatriz; Remoroza, Connie; Schols, Henk A.; Parajó, Juan C.; Alonso, José L. (2014). "Purification, Characterization, and Prebiotic Properties of Pectic Oligosaccharides from Orange Peel Wastes". Journal of Agricultural and Food Chemistry. 62 (40): 9769–9782. doi:10.1021/jf503475b. ISSN 0021-8561. PMID 25207862. ^ a b c "Galacturonans". Complex Carbohydrate Research Centre, University of Georgia, US. Retrieved 2010-07-23. ^ a b c Buchanan, B. B.; Gruissem, W.; Jones, R. L. (2000). Biochemistry and Molecular Biology of Plants. Rockville, MD USA: American Society of Plant Biologists. ISBN 978-0-943088-37-2. Archived from the original on 2010-07-27. Retrieved 2010-07-23. ^ RG-I. Ccrc.uga.edu. Retrieved on 2012-07-16. ^ rhamnogalacturonan II on www.ccrc.uga.edu. Ccrc.uga.edu. Retrieved on 2012-07-16. ^ Migliori, M.; Gabriele, D.; Checchetti, A.; Battipede, B. (2010). "Compatibility analysis of pectin at different esterification degree from intrinsic viscosity data of diluted ternary solutions". Reactive and Functional Polymers. 70 (10): 863–867. doi:10.1016/j.reactfunctpolym.2010.07.011. ^ May, Colin D. (1990). "Industrial pectins: Sources, production and applications". Carbohydrate Polymers. 12 (1): 79–99. doi:10.1016/0144-8617(90)90105-2. ^ Thakura, B. R.; Singha, R. K.; Handab, A. .K; Raoc, M. A. (1997). "Chemistry and uses of pectin - A review". Critical Reviews in Food Science and Nutrition. 37 (1): 47–73. doi:10.1080/10408399709527767. PMID 9067088. ^ Zy Z, Liang L, Fan X, Yu Z, Hotchkiss AT, Wilk BJ, Eliaz I. "The role of modified citrus pectin as an effective chelator of lead in children hospitalized with toxic lead levels", Altern Ther Health Med. 2008 Jul-Aug;14(4):34-8. ^ Sriamornsak, P. (2011). "Application of pectin in oral drug delivery". Expert Opinion on Drug Delivery. 8 (8): 1009–1023. doi:10.1517/17425247.2011.584867. PMID 21564000. ^ Chemical risks in food. Who.int. Retrieved on 2012-07-16. Codex General Standard for Food Additives (GSFA) Online Database; A list of permitted uses of pectin, further link to the JECFA (…) specification of pectin. European parliament and council directive No 95/2/EC of 20 February 1995 on food additives other than colours and sweeteners; EU-Directive that lists the foods, pectin may be used in. Note: The link points to a "consleg"-version of the directive, that may not include the very latest changes. The Directive will be replaced by a new Regulation for food additives in the next few years. Certo Health: Information on reported health benefits of apple pectin, (UK).